The Fondis WINEC25RS has the great same features as the WINEC25S, but this unit can be fitted to an external wall thanks to the fitted Frost Belt. The WINEC25SR compressor has a heating belt so it won't frost if placed externally, we would recommend a cover over the top of the installation on the external wall to prevent direct contact with snow etc. 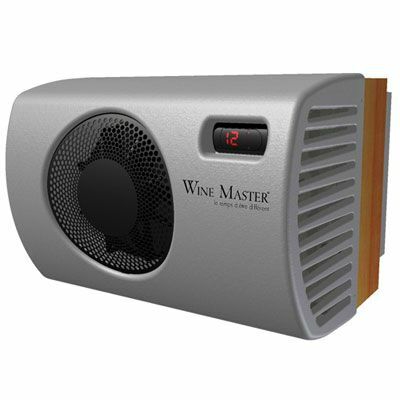 This unit MUST be installed through a wall, either an internal wall or an external wall, it will keep the wine cellar cool on the inside and warm on the outside (where the unit is ventilated too). If venting to an internal room within the house, the room mustn't be a boiler or plant room as the unit will over work and your desired humidity will not be reached. On average, a humidity of approximate 65% is perfect for a wine cellar. Cabinets have a pre-set temperature of 12°C. Click here to see the Fondis Dust Filter for the WINEC25S. Click to view the WINEC25SR Fondis User Manual.